At the Olympics, humans try to go "higher, faster, stronger" - and achieve their personal best. The bar is constantly raised. Drugs don't have to be better to cross the line, though: they can get by on what's called non-inferiority or equivalence trials. "No worse" (more or less) can be good enough. Some drugs are now only loosely possibly non-inferior to other non-inferior drugs - several degrees removed from proven superior to doing nothing. Add the increasing reliance on shortcut measures of what works, and there's a real worry that for drugs, the performance bar is being lowered. 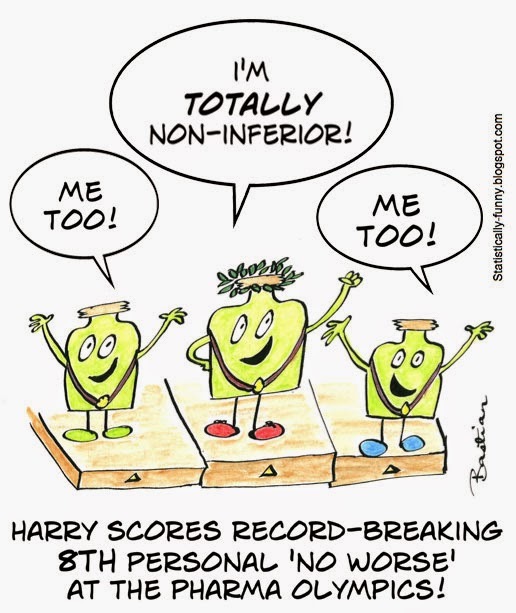 If you want to read about the differences between traditional randomized controlled trials that can show superiority and their non-inferiority/equivalence cousins, click on the PDF here at the CONSORT website.